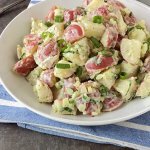 Lightly creamy and delicious, this Red Potato Salad recipe is sure to become a favorite backyard barbecue side dish this Summer! We’re quickly getting back into the season of backyard cookouts and picnics. What backyard barbecue would be complete without a tasty potato salad? 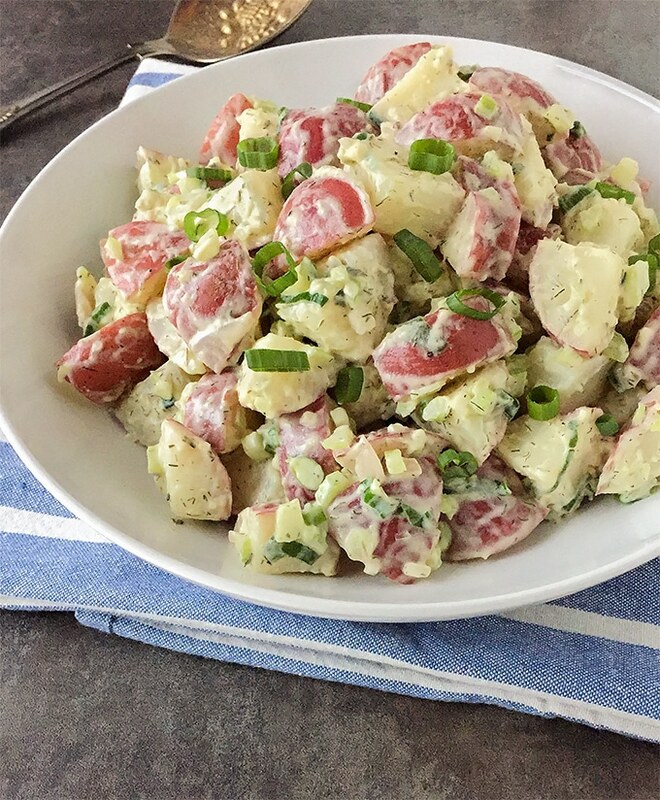 This Red Potato Salad is sure to become a family favorite this Summer! Growing up, my mom always made mashed potato salad. There were no chunks, and that’s what I thought potato salad should be. No chunks, just smooth potatoes packed with yummy flavor. Her potato salad was just so incredibly good! Fast forward to now, and I’ve become a huge fan of a chunky-style of potato salad. Mom’s will always be a top fave, but I’ve grown to love a different style, too. I didn’t want my Red Potato Salad to be super heavy on the mayo. I wanted it to be just creamy enough, and that’s what I created. The dressing is deliciously creamy and light all at the same time! I substituted yogurt for some of the mayo and it also gets some healthy fat from extra virgin olive oil. This potato salad is packed with tasty flavors that get better as they have a chance to marry. You can serve this after a thirty minute refrigeration time, but I found I liked it even more on the second day. How about you? Mashed or chunky-style potato salad fan? Lightly creamy and delicious, this Baby Red Potato Salad recipe is sure to become a favorite backyard barbecue side dish this Summer! Place potatoes into a large saucepan, add salt and enough water to cover by an inch. Bring to a boil over high heat, reduce heat to medium and let simmer until potatoes are just tender, about 10 minutes. Drain potatoes well and place into a large bowl. Add vinegar to the bowl and gently toss until potatoes are evenly coated. Refrigerate until potatoes have cooled, about 30 minutes. Meanwhile, in a medium bowl, whisk together the olive oil, yogurt, mayo, dijon mustard, shallot, dill, salt and pepper to taste. Add it to the bowl of cooled potatoes along with the celery and scallions. Gently toss together until combined. Check seasoning and adjust if necessary, then serve. Salad can be refrigerated for up to 2 days. I think this actually taste better after the flavors marry for a day, but it's still delicious if served after the initial 30 minute refrigeration.